Parka Avenue: The Dance Crazes of the Sixties - Mods & Rockers Unite! The Dance Crazes of the Sixties - Mods & Rockers Unite! Mods dancing at Ready, Steady, Go! I always loved to dance. At a club, if you want to find me, I'll either be behind the decks or on the floor dancing and sweating. I'm not the type to lean against the bar all night. - I took a good five years of latin dance courses. I enjoyed every minute of learning how to dance Salsa, Merengue and Bachata. - I can't count how many times I have fantasized, as a teenager, about being the Ace Face in the Brighton Ball scene in Quadrophenia. What I like almost as much as dancing is spinning Soul tunes that are about dance moves. Dance crazes appeared on a weekly basis in the sixties and Mods were not immune to the fads sweeping the world. One of my all-time favorite tracks, that is garanteed to get a crowd going, is Wilson Picket's cover of Cannibal & The Headhunters song Land of a Thousand Dances. In it, you'll hear no less than 16 of these dances being named. When I first put my hands on Terry Rawlings' book Mod: A Very British Phenomenon, I saw on page 115, the cover of this 60s magazine. I was curious to see what was on the inside so I went on the hunt to find a copy. Was this going to be the ticket for me to become the Mod equivalent of John Travolta in Saturday Night Fever? I wanted to step up my game and be prepared in case a dance-off was to be declared against a Rocker. Dancing the Philip Blues on Ready Steady Go! Here are a few scans of classic dance moves from the era. I skipped the pages with demonstrations by the Rockers for obvious reasons. One, they look silly and the dances are, of course, boring. Did I really need to tell you that? After looking at the magazine, I thought I would try to name as many dances as I could. When Wilson Pickett sings about the land of a thousand dances, he's not kidding. 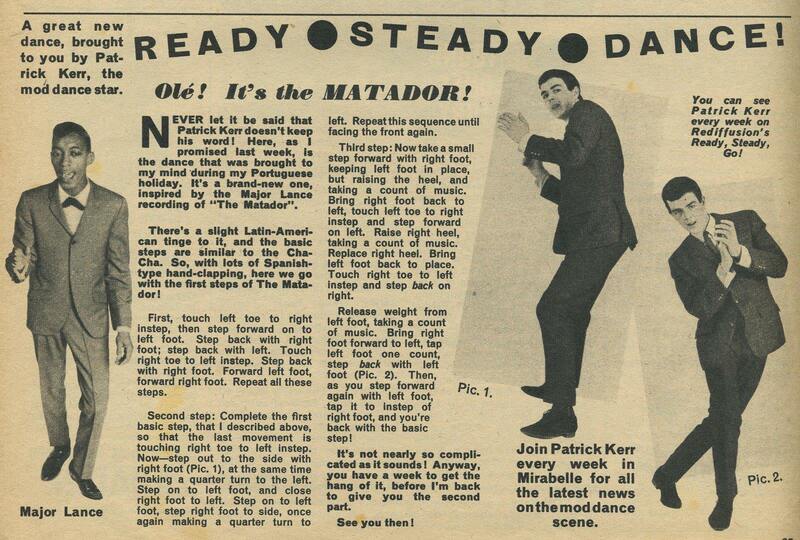 There's even one called Doin' The Mod! I had the help of the internet when I ran out of ideas. I tried to divide them up into categories to show you how themes seem to emerge. I tried to concentrate mainly on Soul tunes with the odd Pop song thrown in there for good measure. You can also check out this post I did in Febuary 2011 featuring Soul tracks that were all about man's best friend, the pooch. The animal kingdom was a great source of inspiration for a lot of dance fads of the sixties because as we all know, animals like the mule, the camel or the goat sure know how to get down on a dance floor. I summed up so many different animal dances that I had to come up with sub-categories. If you want to learn how to dance them all, good luck! Here's some advice. When the singer says at one point in the song "And it goes like this..." pay careful attention. In order to get you started, why don't you shimmy over to the Parka Avenue Mixcloud page and listen to DJ Parka Pat's latest podcast - Land of the 15 dances. You'll find a compilation of some of my favorite Soul dances from the 60s. And if you don't feel like learning all the dance steps, do like I do and freestyle baby! I heard The Pony, Mash Potato, The Fly, all sorts. Your best bet would probably be Modraphelia. Good luck! Love your blog! I'm going to see Paul Weller in a few weeks at the Apollo in NYC. You posts will help me prepare accordingly. Keep up the great work! Cheers! Paul Weller at the Apollo in NYC. I'm jealous! I'M JEALOUS! Of the dances mentioned, The Alligator is most often found in recent videos. See https://sites.google.com/site/gatorpile for numerous examples. nice article! probably a silly question, but could you share your copy of the magazine? or at least tell me where I can find it? thanks! I found my copy on eBay. All you need is a little money and some patience. Good luck!